Inc. Cordless Compact Drill/Driver, Impact Driver, 2x2.0AH Batteries, Charger, Cooler Bag & Bottle Opener. 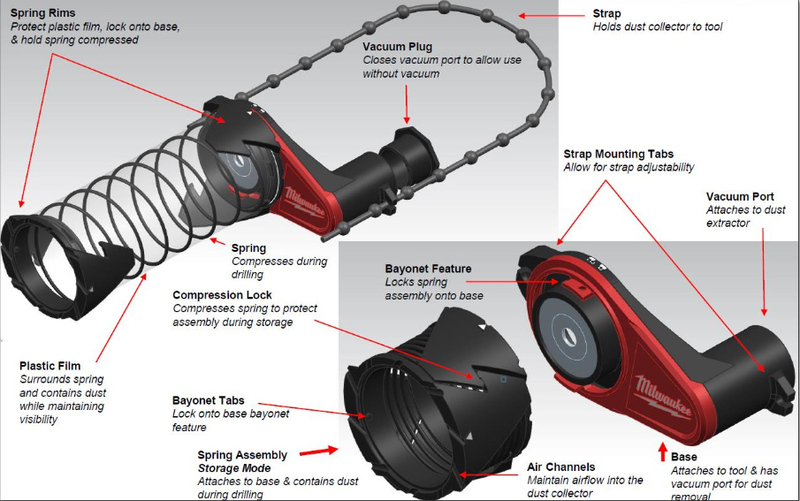 The Milwaukee SDS Plus Dust Trap is a new product within the dust extraction category. Electricians will drill into concrete and masonry to run cables inside conduit. Plumbers drill into concrete and masonry to hold pipes along walls and ceilings. HVAC specialists drill into concrete and masonry to install ventilation ducting, often along the ceiling of each floor on a multi-story building. The SDS Plus Dust Trap is designed to be universal, and suits most rotary hammers for most users and trades. Ensures containment of most dust possible. Promotes visibility to ensure accurate drilling. Sleeve and spring are quickly removable to wipe and clear of trapped dust. Captures dangerous silica dust while drilling concrete. Especially effective when drilling overhead. Will attach to most leading brands of rotary hammers through the handle loop. Quickly and easily change from one rotary hammer to another if required. *Note: Spring assembly is red on actual product.